Go to your dashboard and then Company > Employees. You will see a table detailing all employees. 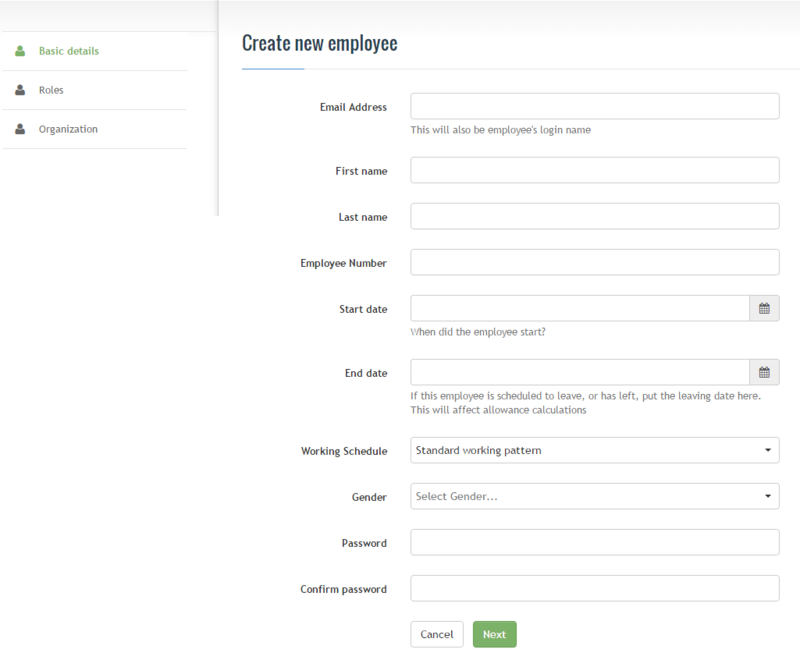 The Employees screen can be used to add new users into the system or to edit existing users. There is also the facility to lock an employee’s access to their profile. 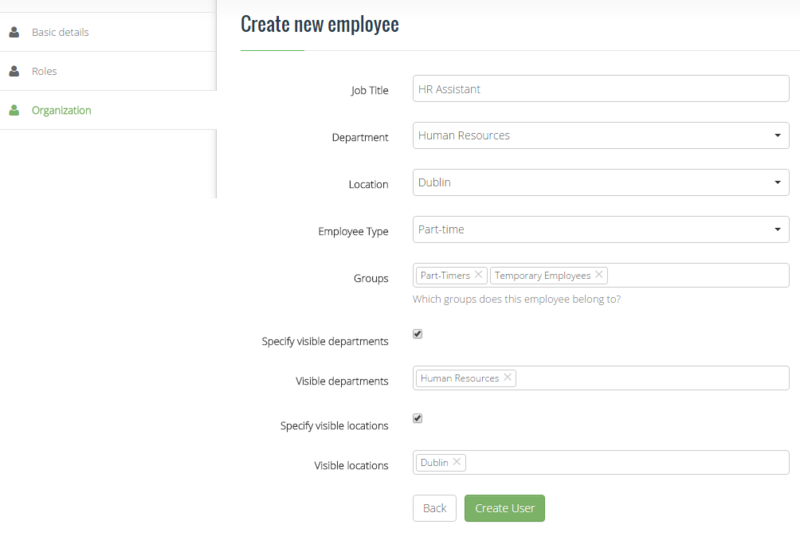 To create new employees select the ‘add new employee‘ button. There are four pages on the initial “Create new employee” form. First name This is mandatory. Last name This is mandatory. Employee Number This is optional. A message will generate if the number is already in use. Start date This is optional. You only need to select a date if the employee started with the company any later than the first day of the current year. This date is taken into account when calculating the employee’s entitlement for the current year, and the number of accrued days. End date This is optional. You only need to select a date if the employee has left the company or has specified a date when he/she will leave. This date is taken into account when calculating the employee’s entitlement for the current year, and the number of accrued days. Password Mandatory. A message will generate if it is invalid. Confirm password Mandatory. A message will generate if it is invalid. When these fields are completed, click ‘Next‘ button. To allocate roles to employees, select the relevant box. The roles allow access to reports, HR functions or billings. Please note that leaving all roles blank will restrict access to any reporting function. This is typical for an entry-level employee. Receptionist This feature is added to our roadmap and will be available in the upcoming releases. Account Manager This permission type allows a user to access Accounts tab, create and modify the billing account and add credit card details used for the automated billing. Payroll Administrator This feature is added to our roadmap and will be available in the upcoming releases. HR User This permission type gives a user limited access to update some company settings (Employees, Working Schedules, Absence Types, Allowance Types, Departments, Locations, General settings, Non-working days, Company Notices). HR Users can also record absences on behalf of other employees. HR Manager This permission type gives a user full access to update company settings same as HR User as well as advanced settings (Edit company policy, Email Templates, Employee Types, Employee Groups, Genders). HR Managers can also record absences on behalf of other employees. Company Director This feature is added to our roadmap and will be available in the upcoming releases. Approver This permission type allows a user to approve or reject requests added to the system by their direct reports. An approver can also record absences on behalf of employees they approve the leave for. Fire Warden This feature is added to our roadmap and will be available in the upcoming releases. Can record absences Enables user to request the absence in the system. This permission is granted by default to all employees and cannot be edited. Can access reports Enable user access to all Reports available on the system. Currently, reports access is not limited, and all reports are visible when this permission has been granted. When these fields are complete select ‘Create User‘. This will enter the new employee into the system. The employee will then receive an email to this effect. After creating a new user, you will see several additional pages. These pages provide additional information and functionality on the user.